Immortalised in countless golf pictures and posters worldwide, Arnold Palmer is less a legendary sportsman and more a true icon of our times. Once considered the undisputed global champion, Arnold Palmer earned his nickname – ‘The King’ – through years of hard work, dedication and truly remarkable success. Born in Latrobe, Pennsylvania on September 10, 1929, Arnold Palmer seemed destined for greatness from an early age. His father was a country club groundskeeper and a keen golfer at the time of Arnold’s birth. Palmer sky-rocketed to global fame after becoming the first person to win the Masters on four separate occasions, ultimately enjoying an incredible career that spanned a full five decades. He won more than 90 major tournaments during his career and scored more high-profile sponsorship deals than anyone in the history of professional golf – his name and logo being officially trademarked in 1968. Palmer died at the age of 87 in 2016. Arnold Daniel Palmer was the son of Milfred J. “Deacon” Palmer – a groundskeeper and professional golfer who introduced Arnold to golf when he was just a toddler. So keen was his father to give him the best possible start, he personally modified a set of regulation golf clubs to be the perfect size for Arnold to use. So rather than starting out with the usual kiddie-clubs, Arnold Palmer was already using pro-grade gear as a toddler. With professional golf in his genetics, the whole thing came to his quite instinctively. By the age of 17, Arnold Palmer had already climbed the ranks in amateur stakes and had a fair few championships under his belt. Things took a significant step forward when he was awarded a scholarship to Wake Forest University, where he went on to win a series of prestigious championships and accolades along the way. Tragically, Palmer lost his teammate and close friend – Bud Worsham – in a car accident in 1950. The incident had such a profound effect on Palmer that he took a three-year hiatus from golf, joining the U.S. Coast Guard and casting doubt on him ever returning to the green. Nevertheless, he was back in business in 1954 and it didn’t take long for him to resume his prior form. The same year, he took home the U.S. Amateur title and his second consecutive win at the Ohio Amateur Championships. By the end of the year, his professional career had officially begun. The first few years of Arnold Palmer’s career were solid enough, seeing him pick up a number of prestigious awards – including his first ever professional victory at the 1955 Canadian Open. However, it would be a little later at the 1958 Masters Tournament in Augusta that would propel this future icon to international fame. By winning the event, Palmer became the youngest ever champion of the tournament at the time and also climbed straight to the top of the annual money list with a purse of $40,000. 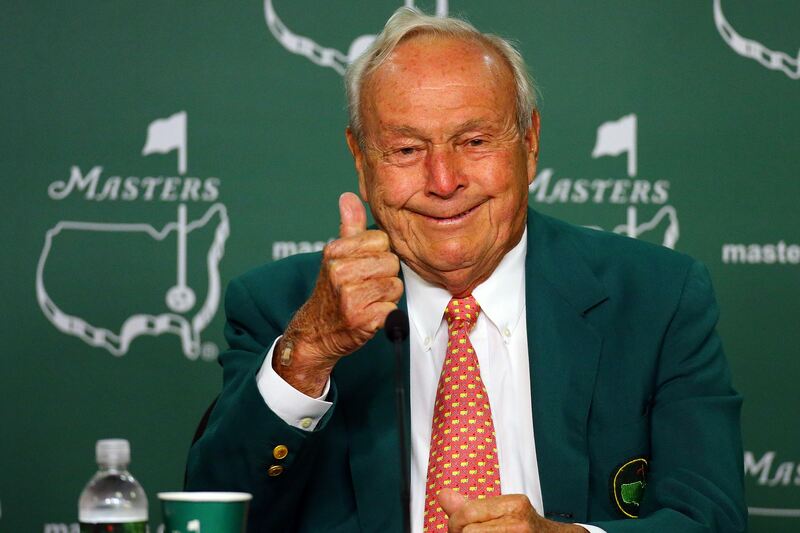 Over the next few years, Palmer enjoyed a run as the most successful and renowned professional golfer in the world. Between 1960 and 1963 alone, he took home an incredible 29 professional titles and an unprecedented $400,000 in prize money. In total, Palmer would go on to scoop up an extraordinary 93 professional titles, taking home seven major championships which included two British Opens and four Masters. The final major accomplishment for Palmer occurred at the 1964 Masters, where he became the first person ever to win the Masters tournament four times. Despite the fact that his prowess in professional golf circles began to gradually decline thereafter, he still remained the highest paid professional golfer in the world for many more years. He also became the first professional golfer to break the $1 million earning mark in 1968. Palmer also managed to scoop up some seriously impressive wins further down the line, including the 1981 U.S. Senior Open and the 1980 PGA Seniors Championship. Along with being one of the most successful and celebrated golfers of all time, Arnold Palmer was also an incredible businessman. At one point during the 1990s, he was raking in an incredible $20 million every year on his sponsorship and general endorsement deals alone. His image and reputation have made him a genuine global an icon for both sports fans and those with no real interest in golf alike. His line of soft drinks in a particular continues his legacy today. Arnold Palmer passed away at the age of 87 in September 2016 and is survived by his two daughters.